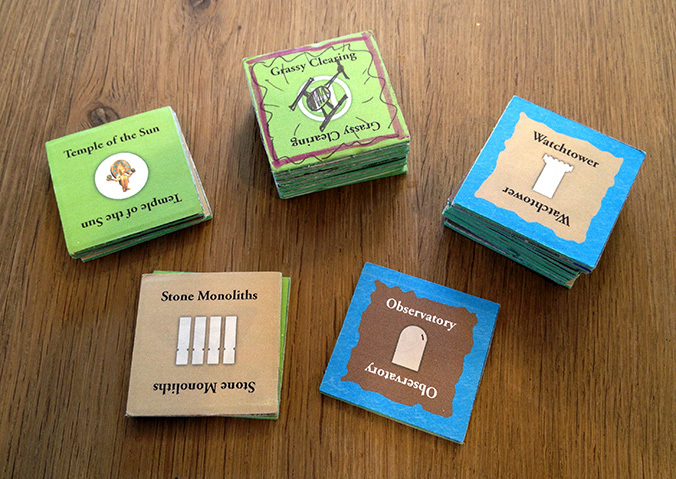 In order to explore prototyping and the product development process, I thought it would be fun to focus on three games published by Gamewright: Sleeping Queens, Forbidden Island, and Too Many Monkeys. This behind-the-scenes look at how the games were made also includes some tips from the games' developers on how to make a successful prototype. This game sounds like it was made by a 6 year old. As it turns out, I was right. Miranda Evarts, the lead developer, was 6 at the time. She had a little help from her parents and from her sister Madeleine. In short, the developer's early-round prototype of Sleeping Queens was perfect even though the prototype was drawn in crayon. Here's what a few of the cards looked like as prototypes. Cute, right? In fact they were so cute that the publisher actually considered using Miranda's original art. In the end, however, the marketing and design teams ended up working with illustrator Jimmy Pickering. Here are the same cards as they appear in the finished product. Prototype Tips from The Developer: Miranda Evarts, who is now 19, has the following advice for product developers. "My family and I had a very clear vision of what we wanted the game to be. We play-tested extensively with a large number of friends and were open to making changes based on their input. However, I followed my instincts on the important game-play elements." The Development Process: Acclaimed game developer Matt Leacock was best known for creating Pandemic [Z-Man Games], an intense strategy game where the players try to save the world from a global virus outbreak. Instead of playing against each other, everybody works together as a team to beat the game. As Wil Wheaton described Pandemic on his show Tabletop, "it's unbelievably difficult, but I've had more fun losing this game than I have had winning a lot of others." Be short enough for players to work into their game-night schedules. With those goals in mind, Matt developed Forbidden Island. In the game, players take on the roles of adventurers trying to collect four ancient treasures from the mysterious Forbidden Island. In order to win, the team will have to successfully move all of the treasures -- and all of the players -- to the helicopter before the island sinks beneath their feet. In the development process, all games need to be fine-tuned so that the difficulty level is properly "balanced" with the player's sense of accomplishment and satisfaction. Forbidden Island needed to be especially well-balanced since the players are playing against the game itself. Throughout the process, Matt and Jason used the prototypes to test out new variations on the rules and to adjust the special abilities of each of the characters. Once the gameplay was locked down, the prototype was turned into a finished product. In addition to adding fantasy art from illustrator C.B. Canga, the final game included mini-figs for each of the collectible treasures along with other special game pieces. Prototype Tips from The Developer: Matt Leacock shared the following insights about product development. "One thing I've learned over the last 20+ years of prototyping is to not over-invest in artwork during the early stages of game development. I learned this when designing one of the first games I brought to market called Lunatix Loop. I was in school for graphic design at the time and I was eager to put my new skills to use. I spent countless hours on the visuals of the game, fine tuning the minute details of all the icons. I started this refinement before the mechanisms in the game were developed or tested. This made it really hard to iterate on the game since in many cases that would mean throwing away all the hours I'd spent on the existing components." "I still pay a lot of attention to design when I'm developing my current prototypes," he continued, "but I'm more careful where I spend it. When it comes to the visuals, most of my energy goes into improving the accessibility of the game as I iterate. I'll experiment with different form factors and materials or refine turns of phrase, deferring the visual polish until the end. And now that I partner with publishers, I can hand off my prototypes to production teams that include professional graphic designers who are happy to take my work to the next level once the fundamentals of the design are complete." Too Many Monkeys is based on an old card game named Garbage (also sometimes known as Trash.) Garbage, which is played with a deck of standard playing cards, is completely based on luck and the players make almost no choices throughout the game. It's less of a game and more of a way to keep idle hands occupied. However, Garbage does have one compelling feature; players flip cards over in a potentially fast-paced chain reaction. Jason Schneider of Gamewrite asked me if I could salvage that basic mechanic and make it suitable and fun for kids in the "Ages 6 and Up" market. With that marketing goal, the development process was all about refining the game by stripping away the dull parts and adding new elements to make it more engaging. Basically, Too Many Monkeys is to Garbage what Uno is to Crazy Eights. Shortening the time it takes to play the game so children stay focused. And then there's the theme. Although the theme of a game is often secondary to gameplay, in this case the game tells a story. Primo the Monkey just wants to get a good night sleep, but his friends have invited themselves over for a wild slumber party. 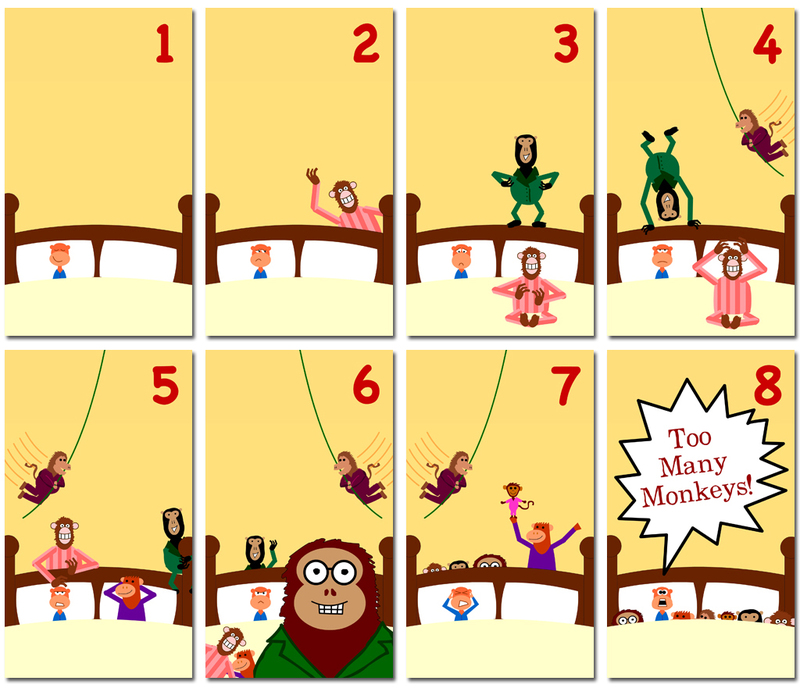 Over the course of a full game, the party gets smaller and smaller until someone wins by helping the main monkey go back to bed. Prototype Tips from The Developer: Normally when one creates a prototype, it's best to strip away anything that isn't a core feature. However, because the prototype of a card game is so mechanically similar to the final product, it was easy for Jason and Gamewright to modify the game on the fly in the middle of focus group testing. For example, I had already reduced the number of cards in a hand from 10 to 8, but since the game wasn't fast enough for some players all Jason had to do was toss aside a few cards so there were only 6 cards in a hand. When working on new games, I try to keep this in mind so that rules and cards can easily be removed, modified, or added during testing.